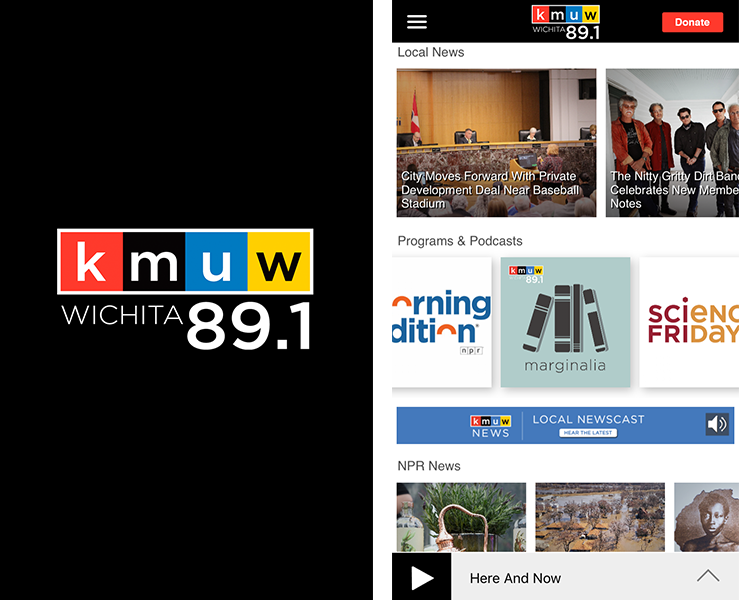 KMUW's free app is available for Apple and Android phones. It features live streaming, your favorite shows on demand, and two-way radio where you can share your thoughts with KMUW. Find it wherever you download apps. Click here for Apple devices, or here for Android devices. Install just like any other app on your device! Join KMUW's livestream, play your favorite shows on demand, and even use the app as an alarm clock! What are some of the features? The KMUW app allows you to listen on your schedule. Missed your favorite program when it aired? Listen to it through our app whenever you want. You can hear the latest local newscast on demand — at the touch of a button. 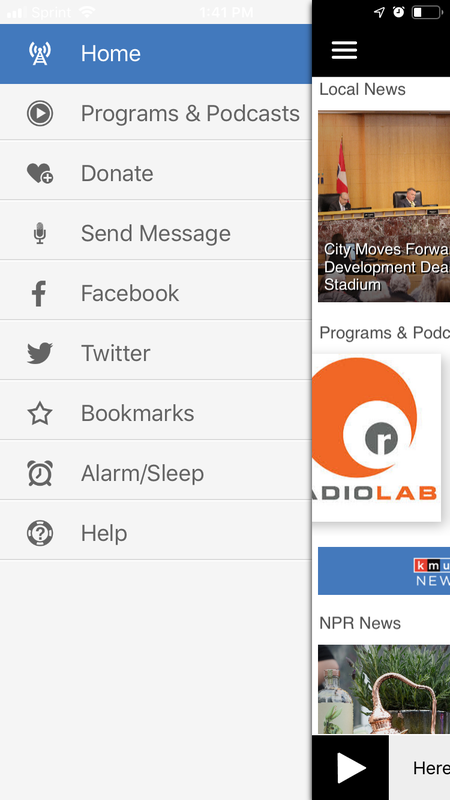 You can connect to KMUW in a variety of ways through the app: social media, the community calendar. You can even donate through the app! Can I share stories from the app? Start by playing the segment (press "Play" at the bottom of the screen). Click the ^ to the right of the segment title to bring up the share screen. Select your preferred sharing option. Share early and often! Do I have to live in the listening area to use the app? You don't have to be in our listening area to tune in. Listen out of state or even out of the country! 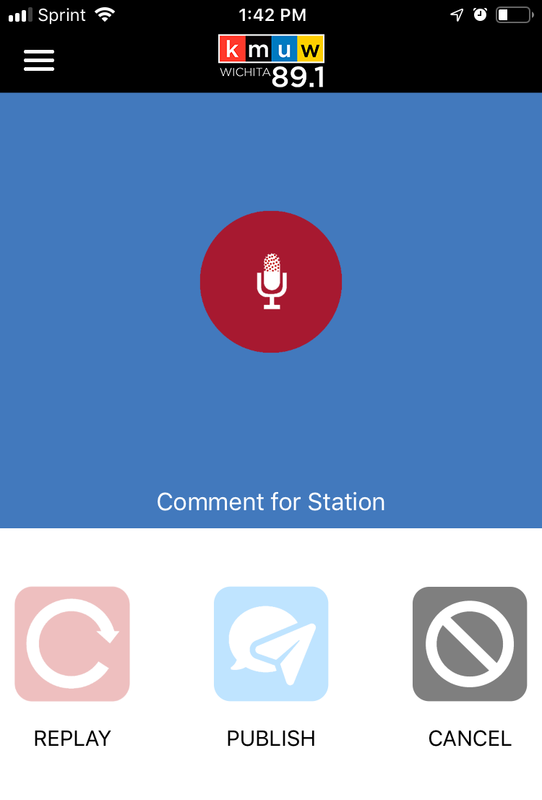 Share your thoughts via the Two-Way Radio feature. Record and send up to a minute of audio. How do I use the livestream? Push the "play" button on the bottom of the screen to join the current broadcast. You can listen to our livestream even while using other apps on your device. Once you're listening, simply press your device's "home" button, and the app will continue to play while you use your other apps. And here's a nifty feature: You can pause the streaming audio for up to 10 minutes, and when you resume listening, you'll be right where you left off. What's this two-way radio all about? Since we're in the audio business, we want to hear from you. Really *hear* from you. Just go to the menu in the upper left corner of the app, select "Send Message" and record up to a minute of audio to send to us. You can also scroll down to the latest Two-Way Radio question and follow the same steps.